You can hear the band sound byte by clicking on the demo below. 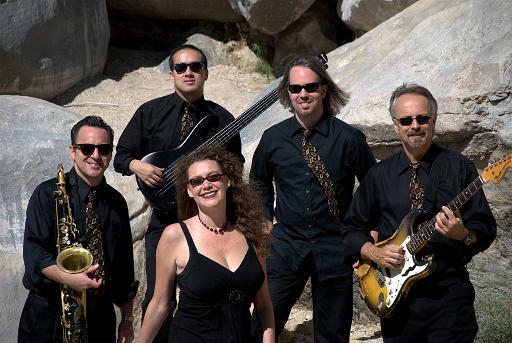 The K – N band is a 5-7 piece band that is incredibly Fun and Energetic. They play a varied mixture of Jazz, Swing, Blues, Latin, and many standard songs -see the song list below for their extensive list. They like to call it Martini Music and people get up dancing. This married tandem with their band have played all over L.A. in many Weddings, Private Parties, and local Venues including the House of Blues. They have played in many big Casinos in Las Vegas, Laughlin, and Arizona and have a huge tour planned in the summer of 2003 across the United States. Nicole and Kirk are the lead singers while Kirk also plays a dynamic saxophone. The group is rounded out with a drummer, bass, and guitar. Keyboards and Trumpet can be added or interchanged. This Act is definitely a crowd pleaser and pure enjoyment! This flexible, easy to work with group has many great references and a fabulous song list.